- = Unlikely to be considered due to appearance difference or other reason Bolt pdf. In this category Black or Bright Steel means plain carbon and low alloy steels regardless of mechanical properties. Protection of the small area of the fastener depends on amount of zinc available on the surrounding die cast or galvanised surface. This combination is widely used in airframe construction. 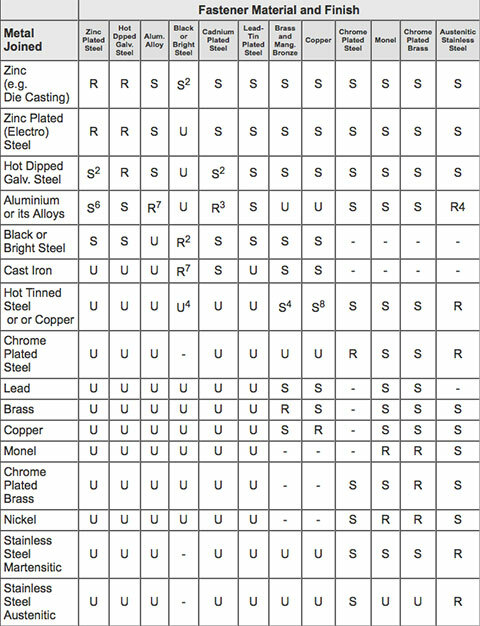 Corrosion possibilities are further reduced by the use in assembly of zinc or barium chromate filled jointing compound. Recommended alternatively with aluminium alloys if better mechanical properties are required than are obtainable with the latter. E.g., there might be required higher strength in a bolt or greater hardness in a self-tapping screw. It is sometimes advised for critical applications that fasteners made from stainless steel may be cadmium plated for use on contact with aluminium alloys. Trade usage of the term “Chrome-Plated” really means adequate under-deposits of copper and/or nickel finished with a chromium deposit. Aluminium is the protected member of aluminium-zinc combinations, causing accelerated corrosion of the zinc. Since wastage of the zinc will eventually lead to exposure of the basic steel of the fastener, and then this bare steel could accelerate corrosion of the aluminium – and also cause staining, the greater the available amount of zinc the better. Thus, in the absence of painting, the more heavily coated hot dipped galvanised fastener is a better choice than its zinc plated counterpart. It is not intended to imply that the exposure of these materials in an unprotected condition in a corrosive environment will yield a satisfactory behaviour. The recommendation is essentially for elimination of galvanic corrosion. Subsequent hot tinning of an assembly containing this metal as a fastener upgrades its suitability to being a recommended practice; the key symbol, without qualification, refers to the combination without further processing. Hot tinning of assemblies containing mixed metals is extensively practised in food industries.